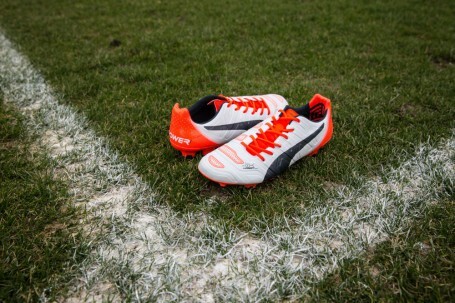 Herzogenaurach, Germany (1 July, 2015) – As the European clubs return to pre-season training, PUMA today introduced the latest evoPOWER 1.2 football boot with a complete new look. Fully relaxed after their summer break, PUMA players Cesc Fàbregas and Mario Balotelli will present their new boots to the world in white, total eclipse and lava blast when they step back into action. Many other stars including Olivier Giroud, Gianluigi Buffon and Dante will wear the new boots to add maximum power and accuracy to their game. Taking its inspiration from the movement of a barefoot, the boot allows for a natural foot mechanical movement, providing maximum flexibility which has an enhanced impact on shooting and kicking power. The boot’s lightweight and super soft upper material stretches in a longitudinal not lateral direction providing freedom of movement while maintaining support. The evoPOWER 1.2 outsole features a spine that delivers stability from the heel to the forefoot and enables the foot to bend like a barefoot at the same time. In addition to power, the boot impresses through accuracy, which is once again improved with the GripTex print that runs across the full length of the upper, designed to enhance ball control in all weather conditions. Added shooting and passing precision is created through the lightweight AccuFoam lining that provides a clean kicking surface. The new colourway of the evoPOWER 1.2 boot will be available in-store and on puma.com from today. A full colour aligned collection including training apparel and accessories, shin pads and balls will also be available to purchase from now.